It’s hard to remember, but there was a time when Kevin Costner was the biggest movie star in the world. The world. From about 1989 to 1992, Costner was THE MAN. I would love someone to some day write a book about the making of Waterworld that ate up years of Costner’s life and completely decimated his career (through his own doing, though, no doubt). After taking time away, in the last two years, Costner’s been making a comeback as a character actor in The Hatfields & McCoys, Man of Steel and Jack Ryan earlier this year. I’ve really enjoyed those outings of his and look forward to seeing him try to blend with ensembles, because he really can bring something to the table. It’s when he’s the main attraction that his faults as an actor swing center stage. 3 Days to Kill pairs Costner with McG, whom you’ll recall from such things as ruining the Terminator franchise. 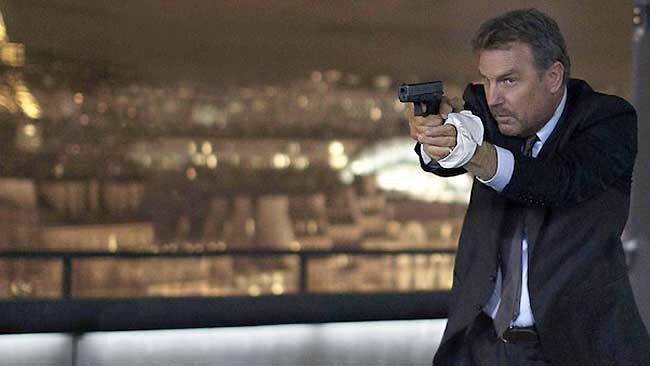 Costner plays a career black ops hit man (CIA is implied but never openly referred to) who finds out he has brain cancer that’s metastasized into his lungs. He has maybe five months to live. He returns to Paris to reconnect with his ex-wife (Connie Neilsen, always great to see) and daughter (Hailee Steinfeld). The agency, also, would very much like to continue his employment and offers him a miracle drug if he’ll perform the cinematically famous ONE LAST JOB. The title 3 Days to Kill refers to the weekend he spends with his daughter after his ex-wife learns of his condition and agrees to give him another shot just as long as he’s not working for THEM. Nooooooo. Well, yeah. Costner’s mission for THEM is not really worth summing up because it’s utter gobbledygook hashed together from dozens of better films. The only reason to watch this movie, and the reason the film is way better than it has any right to be is Hailee Steinfeld. Steinfeld who’s already shown what she can do in True Grit and Ender’s Game, plays very well with Costner’s traditional blandness, bouncing all over the emotional spectrum as a typical teenager while her dad is trying desperately to kill people and finish his mission without her finding out what he actually does. I loved Costner as a leading man. Untouchables, Field of Dreams, Robin Hood… I’m not sure what it was about him, but he was extremely watchable and held his own next to Sean Connery, James Earl Jones, and Alan Rickman. Also, Waterworld was kind of neat. There. I’ve said it. What I don’t understand is how he was given another chance to make a big movie, and he chose to make The Postman. The Making of The Postman could be a sequel to my requested book on Waterworld: Film Fiasco. I love how in Robin Hood he didn’t even try an accent. His Robin Hood was from Iowa and everyone else was just going to have to freaking deal. The Sheriff of Nottingham’s hag advisor puts the movie over the top. Suffice it to say there had never been a Robin Hood like this, and there never will be again. Just a fascinatingly weird version of the story. I’m partial to Morgan Freeman as Robin Hood’s sidekick instead of Little John and nothing can top craaaaaazy Sherrif Alan Rickman. It’s a good bad movie. A good bad movie is right. Did you know that a subplot was cut, in which the sheriff learned that the hag was his mother? The sheriff’s dying words were originally “Who was Dad?” I would have liked it if that had been left in, because of the way it would have completely tangentialized away from the Robin Hood story. Simple pleasures. Oh WOW. I cannot decide if that would have made the weirdness of her taking a scimitar to the chest any weirder…..but I love that somewhere, at some time….people debated that.